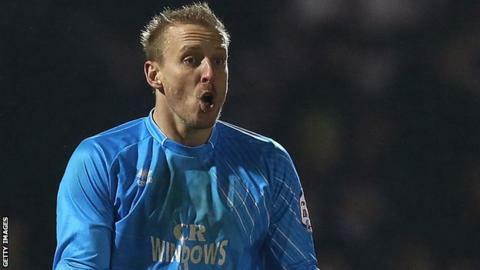 Goalkeeper Steve Mildenhall has insisted there will be no cause for celebration if Bristol Rovers avoid relegation from League Two. The Pirates are three points above the drop zone following last weekend's win over Wycombe. A draw at home to Mansfield this Saturday's will guarantee survival. "It's a strange one. I don't see a way of celebrating when you've staved off failure," the 35-year-old told BBC Radio Bristol. "In a way there will be a huge amount of relief. I'll probably have a 10-second moment of euphoria and then probably a long while of anger about the year we've had." Bristol Rovers struggled for form over the winter but a run of three wins and three draws during February and March took them up to 14th. However, their results declined again and, since Darrell Clarke came in as manager on 28 March, they have won only two games. "We could say a few things about a few situations but as players, that's not really our job," continued Mildenhall. "We need to get the season out of the way and then the powers that be will sit down and look to dissect it. "They will see what went on, what could have been done better and what should be done better in the future."